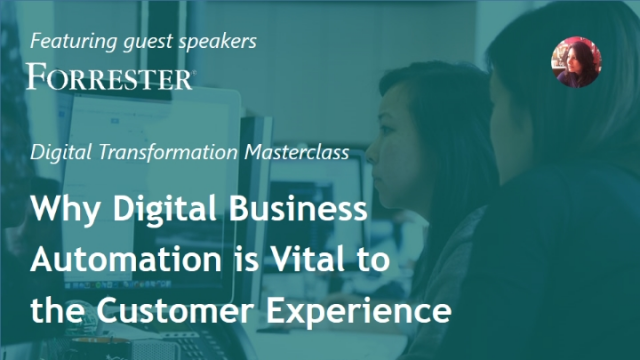 As businesses strive to transform in order to survive and thrive in the digital age, digital initiatives have become increasingly focused on the customer experience (CX) rather than more traditional goals of efficiency and cost reduction. So what does this mean for those tasked with delivering digital innovation and applications to the business? It means re-thinking operational models to connect employees, processes and devices with personalized and contextualized information – all to better serve customers. Join Bizagi and guest speaker Rob Koplowitz, VP and Principal Analyst at Forrester Research as they discuss how today’s digital platform technologies can support these goals. -What does digital transformation mean for traditional businesses? -Why is the shift from cost efficiency to customer experience so important? -How can digital platforms help you improve the customer experience? Who should attend: Digital Transformation Leaders, Application Development Leaders, IT and Business Process Professionals. Rob’s research focuses on business process management as well as artificial intelligence and cognitive computing. Rob returns to Forrester after leading IBM’s strategy for integrating Watson into the company’s collaboration services. Rob brings many years of experience in enterprise software consulting, product marketing, product management, and strategy.